Not that many decades ago, stay-at-home mothers were the norm in the United States. That started changing during and after World War II because of numerous factors, including the need for women factory workers during the booming war years and a growing post-war economy. This led to two-working-parent households seeking to “keep up with the Joneses,” more women attending college than ever before, and more women joining the workforce to earn their own paycheck or expand their horizons. Today, many women continue to balance career and family, and some are the primary breadwinner. However, an interesting trend has emerged: Although women were once tasked with raising the children, the past two decades have seen a steady increase in the number of men who choose to be stay-at-home dads, although for different reasons. Since 1989, the number of men who do not work outside the home has nearly doubled. 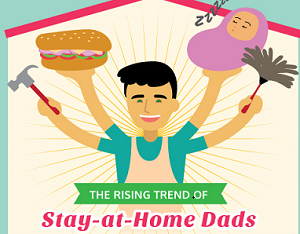 The accompanying infographic features stay-at-home dad statistics that may surprise you.